Bit of a head scratcher this one. 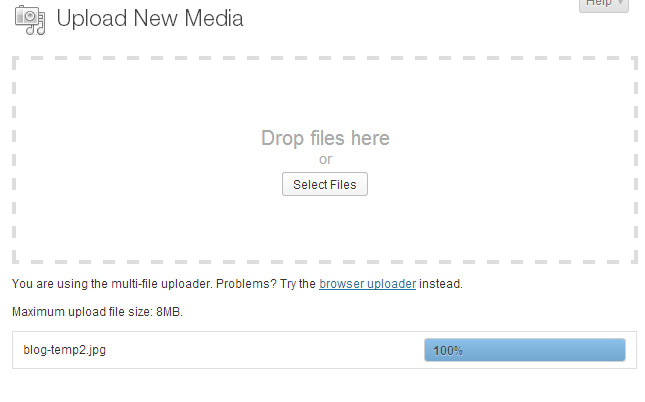 It took me a while to fix an issue with the WordPress image uploader (the multi-file uploader). You try and upload an image and it stalls at ‘100% crunching’. It doesn’t refresh and display the uploaded image, even though the images are present in the upload folder. In addition, when trying to insert new images into posts, none of the images in the media gallery were appearing. This will basically disable the Flash aspect of the image uploader, and the uploader seems to work fine without it. Hi Jeyon, anywhere in your functions.php file should be fine. WordPress however has had many updates since I wrote this post and the image uploading issue you’re having could be a different manifestation of uploading problem and may not be fixable with the code snippet above. Disable all plugins and try again. In my case Word fence Security plugin was acting up so I had deleted the plugin and uploading was fine. picture stay “Crunching…” after it upload 100%. i cant upload new pic to my WP. i deactivate all plugin and theme and nothing happens for issue. also i contact my server hosting but no problem from that side. Go onto your Media gallery/page, and select “Add New”. The multiple file uploader will appear and you will see them appear directly into your gallery once uploaded – that’s what worked for me!